I was born in wartime. 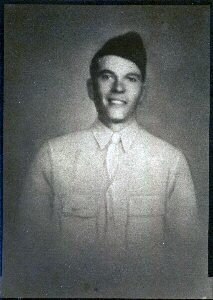 My uncle Herman Volney Nickell (my father's younger brother) died a hero at Normandy on June 17, 1944. (He survived the initial storming of the beaches, but volunteered to go scouting and was wounded by a sniper; being transported back, he was then shot fatally.) When I was born later that year (on December 1), my parents gave me his first name as my middle one. As I wrote in a poem for him ("As His Namesake"—see my autobiography in Contemporary Authors 269): ". . . now I grow old for him—/keep his image in a book, / & keep his looks, / & keep his name like a rank."